Garmin has just announced its latest addition to GPS watches, the Approach S1 which is the first GPS watch for golfers that eliminates the guesswork out of your golf game as it shows you most accurate and real time location based data which will make your golf sport better than before. Approach S1 watch already contains 14,000 U.S. and Canadian courses so there is no need to subscribe to updates or download your favorite course. The Garmin Approach S1 golf GPS watch has a decent battery life. It can last up to 8 hours in GPS mode and up to three weeks in regular watch mode. The Approach S1 has a very sleek and compact design. The watch only weighs 1.8 ounces and comes with backlit display. The S1 golf GPS watch also has automatic time zone detection, can also work as an alarm wrist watch and is ideal for travelers. The golf mode of the Garmin Approach S1 enables you to quickly communicate with the satellite and locate nearby courses. The S1 shows three distances to every hole in the course; front, middle and back of the green. 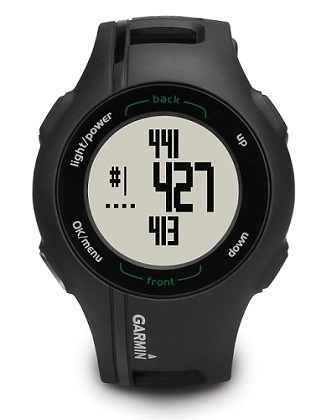 The Garmin Approach S1 also indicates total ground covered by the golfer on foot. Currently there is no information on the price and availability of the Garmin Approach S1 GPS watch. Do check back again for updates.